Every school has a different lice policy. Some schools will not permit students to return until they pass a visual inspection and no nits are found. Every school has their own head lice policy, some schools will not let students attend class with even one nit, while others do not see it as a threat. The American Academy of Pediatrics released an article with the mindset that head lice infestations are not spread at school. As a Lice Removal Specialist, we know this is not factual. We have treated many children over the years. We have had multiple children from the same schools in our facility being treated at the same time! Any social gathering that includes a large number of children can provide the opportunity for a louse to transfer, whether it be at school, gymnastics, baseball, track meets, plays, sleepovers, play dates or bus rides. So what makes schools any different? Where there are children, there are head lice infestations. 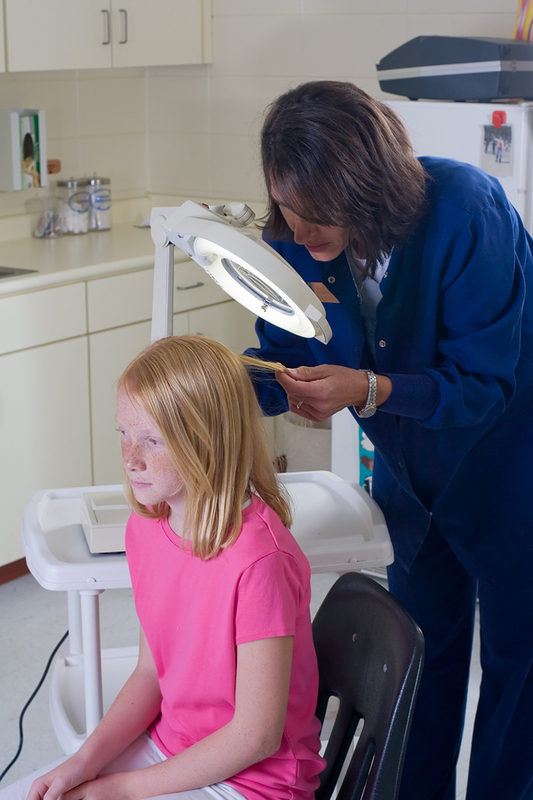 According to The Centers for Disease Control and Prevention, they have estimated that there are approximately 6-12 million head lice infestations in school aged children, ages 3-12, each year. To give a good example, children are in school anywhere from 6 to 7 hours a day, depending on the school district. This means that if children are in school for roughly 180 days…6 hours a day, they are spending approximately 1080 hours in school throughout the year. A louse only needs 3 seconds to transfer to a new host. Think about that for just a second. Now you see how easily one student can catch it from another. That is a lot of time for a lot of lice to find a new home. Researchers have found that parents and caregivers of infected children suffer consequences as well. It is true that lice do not carry disease nor do they discriminate against clean vs dirty hair, but it is still quite mentally, physically and emotionally overwhelming. The social stigma is very real. It causes unnecessary fear, anxiety and even psychological trauma that can be very isolating. So by keeping children in school with head lice, we accomplish absolutely nothing, except for the promise of the spread of head lice throughout the student population attending these schools. As Lice Removal Specialists, we know that there is no single one way to eliminate the spread of head lice but we do know that there are certain steps we can take to prevent it.